Chom Roeun and his wife live with their five children in Anlong Veng, Cambodia. For many years they lacked the means to buy necessities such as food, clothes, and health care -- never mind to provide for their children's education. As a rice farmer in a village full of rice farmers, Chom’s income was meager, and nutrition was limited. The farmers would all buy imported vegetables from neighbouring Vietnam and Thailand, but the prices were high and there were rumours about the chemicals used to grow them. 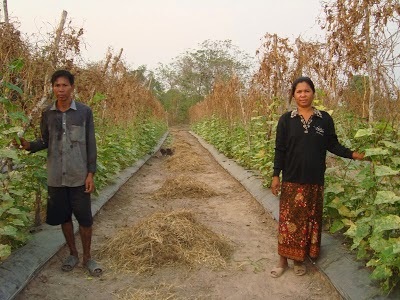 When a local FH trainer came to Chom's village in 2012, Chom was eager to learn the agricultural techniques required to grow long beans and cucumber. The training included lessons on the proper use of organic liquids and hard compost, as well as a demonstration on how to install and maintain a water system using simple tubes and tools. Soon, Chom's family was earning between $750 and $1,000 every three months, allowing them to buy a hand tractor to expand their farm and invest in their family. His wife is also enthusiastic about the difference their income makes. As one example, she explains that their family can now take part in wedding celebrations and traditional ceremonies in the community. "I would like give deep thank to FH staff as they have given us skills that I can use to improve my family's life,” she says. The Roeun family farm serves as an example to other neighbouring farming families. Chom is frequently asked for tips and he’s become somewhat of a trend setter. Other families are also learning to grow vegetables as a source income, diversifying from standard rice farming. To help out another family, check out our Gift Guide http://www.fhcanada.org/gift-guide.